Easy No Bake Strawberry Blueberry Icebox Cake.. Red White Blue Cake.. old fashioned dessert recipe perfect for Memorial Day and 4th of July or any other holiday and special occasions! Incredible Icebox Cake with layers of heavy cream, cream cheese, fresh blueberries and strawberries and lemon juice.. some of my favorite fruity flavors. Feel free to switch to other combo of fresh berry fruits. I have something special on my blog menu today, which I’m sure you’ll love it – and when it comes down to it, these are the best recipes of all: simple, quick and utterly delicious. Celebrate holidays with this decadent festive so easy to make spring/summer dessert. You can take a look most popular No Bake recipes on our blog – No Bake Strawberry Cheesecake and No Bake Chocolate Cheesecake Bars. Delicious and yummy festive Icebox Cake! 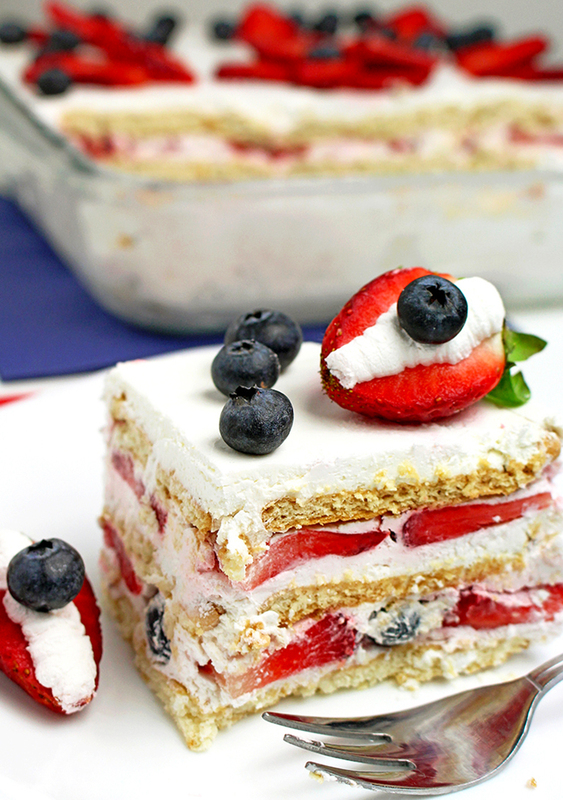 Make it every Day ~ Special Day with this very berry Icebox Cake! It’s spring/summer fun time of strawberries.. so take a look at other strawberry recipes on our blog menu. The change you can made is to substitute the graham crackers with other biscuits. To keep the freshness of the cake cover it and refrigerate. 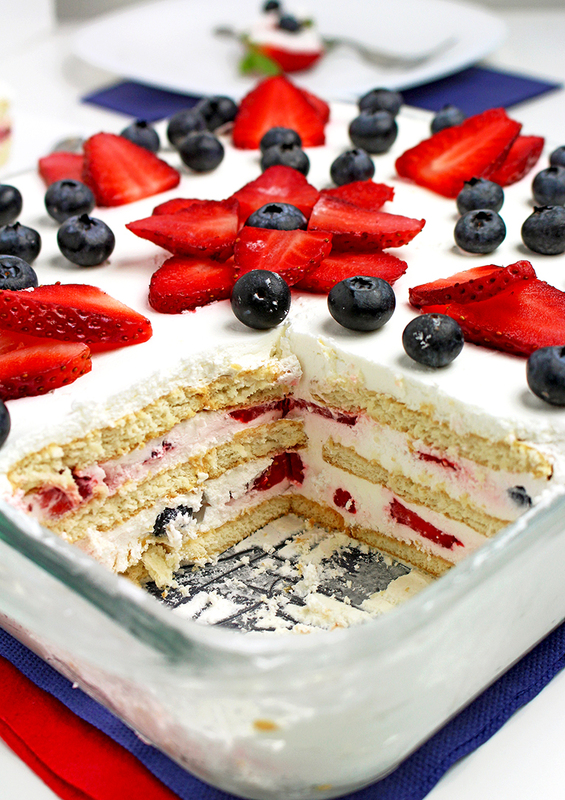 Easy Strawberry Blueberry Icebox Cake.. Red White Blue Cake.. old fashioned dessert recipe. 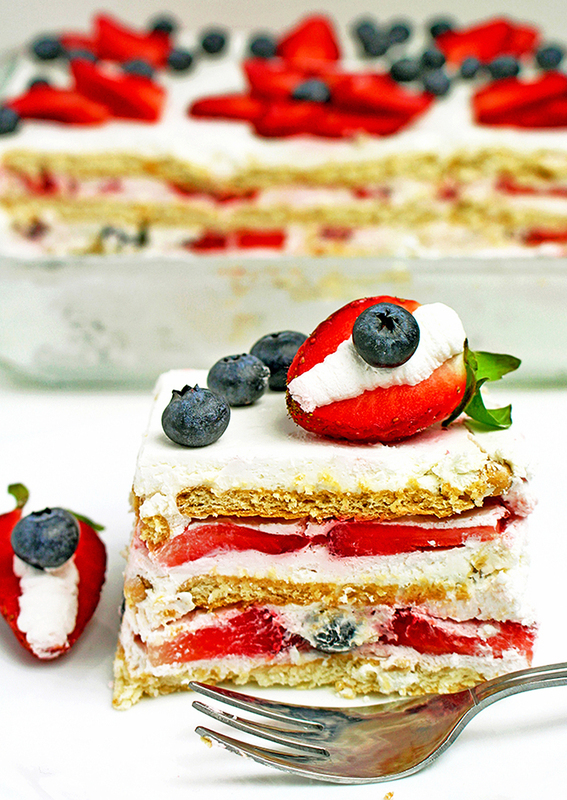 No - bake incredible Icebox Cake with layers of whipped cream, fresh blueberries and strawberries. Squeeze juice from ½ a lemon and leave aside. In a large dish whisk heavy cream with an electric mixer using medium speed, for about 4 -5 minutes. Mix cream cheese, powdered sugar and lemon juice in a separate dish, with an electric mixer at a medium speed until well combined (for about a minute) and add heavy cream. Mix briefly until well combined. Leave aside. Slice strawberries and leave aside. Place thin layer of cheesecake cream at the bottom and sides of an 8x8 inch dish. Place about 4 graham crackers at the bottom of the dish, so that the bottom is covered completely. Put ⅓ cheesecake cream over graham crackers. Put ⅓ of blueberries and ⅓ of strawberries over the cheesecake cream. Repeat the same procedure 2 more times. Cover cake and leave it in the fridge for at least 4 hours. You can leave it in the fridge overnight.